Stress is an insidious health risk mostly caused by trying to control events and people that we can't. It will also impact your family, your organization, and the people you are working to help. During this luncheon, learn helpful tidbits and tricks that are essential to maintaining stability in stressful circumstances. This event is FREE for members (registration required) and includes a full meal. For members with dietary requirements, please contact the Chamber directly at (218) 736-6951. Now is the time to invest in yourself and your career. At bi-monthly professional development events, you will he...ar from prominent business leaders, public officials and industry experts as they explore the latest regional issues and share tips/career advice. Gain valuable networking and leadership skills through YPN’s skill-building workshops that cover topics such as strategic networking and the importance of having a mentor. Today’s young professionals are tomorrow’s leaders! 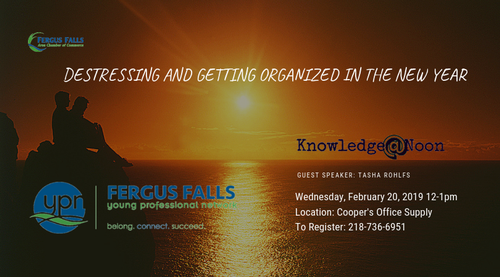 As the premier organization of its kind in the region, the Fergus Falls YPN will help you improve your career, develop your leadership abilities, build your professional network, and give back to the Fergus Falls community. Call the Chamber of Commerce or use email link sent prior to event.